Disclaimer: This post contains affiliate links. This post is written based on my personal experience with Henry; I am not a trainer, veterinarian, or lawyer. Please consult a professional with questions. Having a car in New York City is expensive, not to mention a pain in the tush. 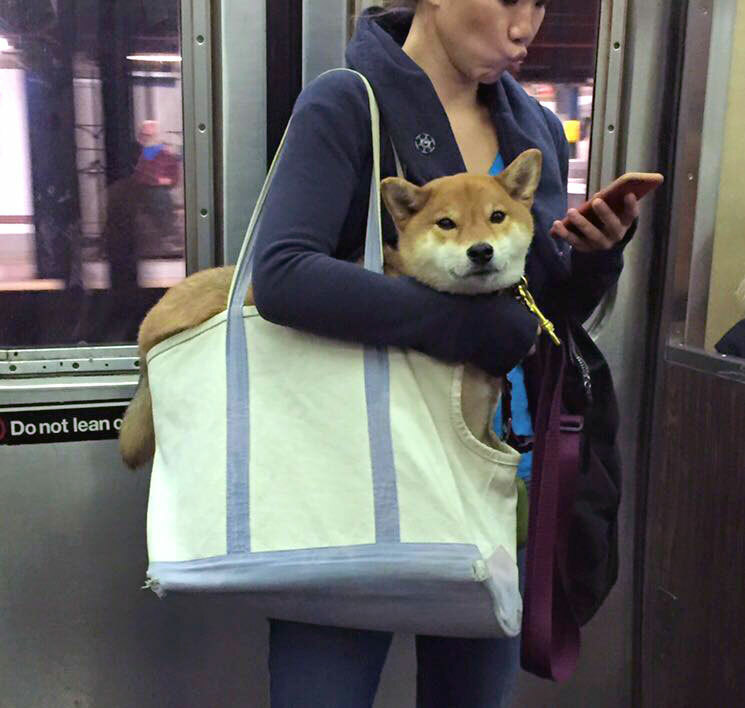 When forced to travel with their dogs, many New Yorkers choose to take the subway. There is a right way and a wrong way to do this, however, especially if your dog stresses easily. 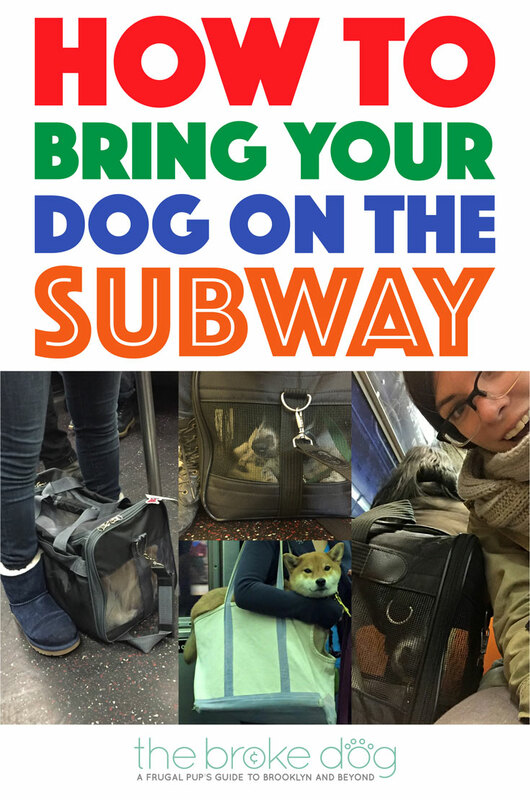 Keep reading to learn how to bring your dog on the subway while following the law and assuring it’s an easy trip for you, your dog, and your fellow passengers. 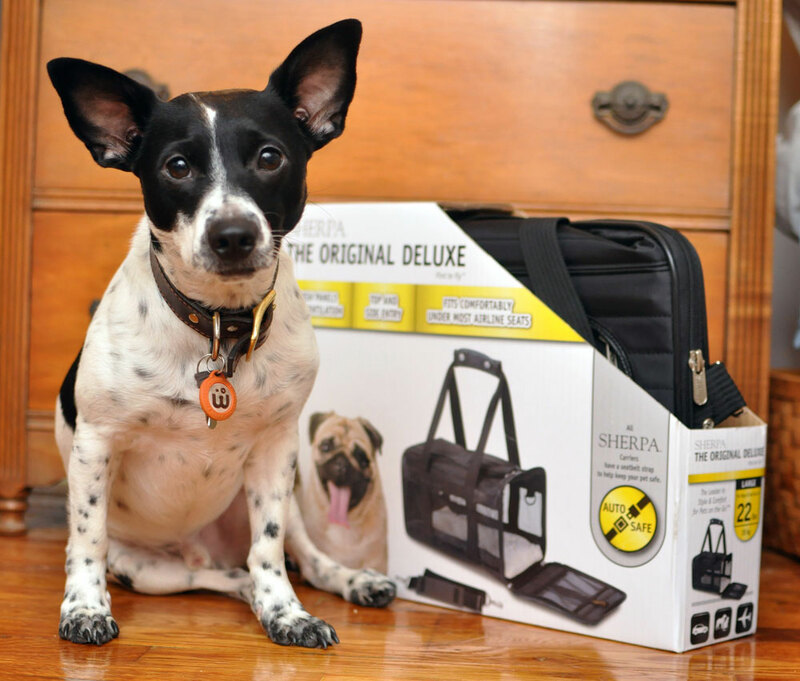 Henry and I use the Sherpa Original Deluxe carrier, and we think that it is the best option on the market. It can zip completely, has two carrying strap options, and a wonderful one-year warranty. A zipper on our last Sherpa carrier broke during the one-year period, and Quaker Pet Group replaced it without an issue. Amazon sells it for almost half the price we paid! Bonus: some Sherpa carriers are also approved for travel on several airlines. Technically not ok: This dog is not fully “enclosed in a container.” It’s adorable, though! What if your dog is too big for a traditional carrier? Well, you either have to invest in a larger carrier (they exist! ), carry your dog in its crate, or get a little creative. This great post from Dog Jaunt has some ideas to get you started. This rule does not apply to dogs working for law enforcement agencies, to service dogs, or service dogs-in-training under a professional trainer’s tutelage. It DOES apply to Emotional Support Dogs. Please refer to the MTA’s website for full policies before you bring your dog on the subway. A subway, with its crowds, shouting passengers, weird noises, and scary vibrations, can be a terrifying place for a dog. If your pup has little experience with public transit, you should take a short test run to gauge his or her reaction. Be sure to do it during a quieter time such as the weekend or later in the evening. Avoid rush hour: the chaos may traumatize your dog enough to make future trips impossible. Take time to acclimate your dog to his or carrier as well. Henry loves his! 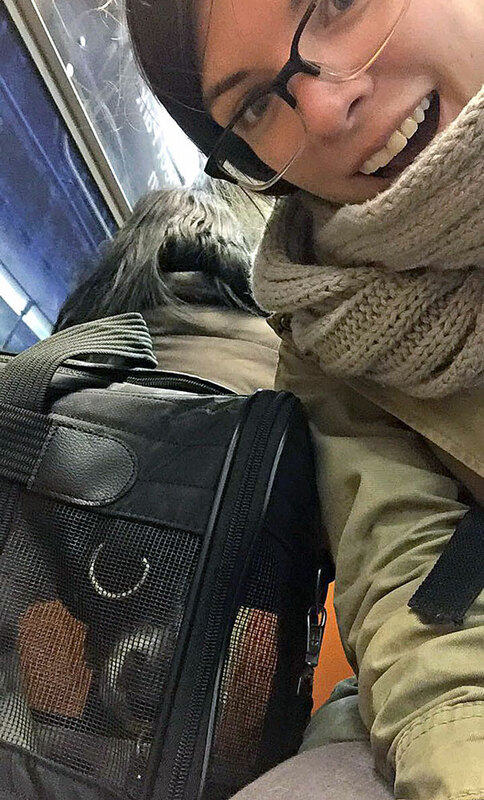 Gradually acclimate your dog to riding the subway before taking him or her on any long trips. For specific techniques, consult a trainer. Henry does NOT enjoy the subway, but it is a necessary evil. To distract him, I bring a few of his favorite treats and a large bully stick or a few Whimzee chews. 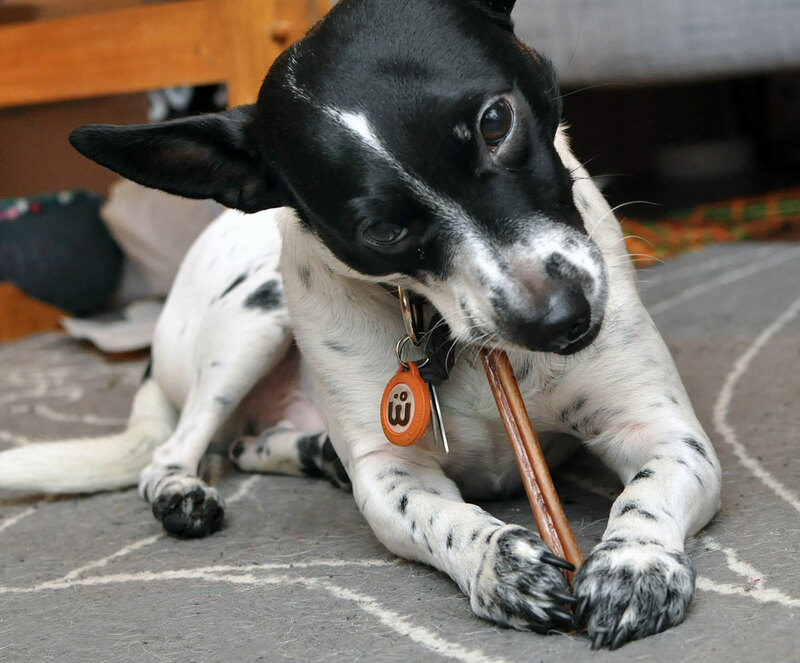 Bully sticks are Henry’s #1 distraction. If a specific toy calms your dog, bring that. Do be careful, however, and refrain from sticking your hand into the carrier if your dog is a resource guarder. Any dog can bite under extremely stressful circumstances, and the stress of being on a train will only make it worse. Even if your dog does not resource guard, exercise caution. Even the best dog can bite in a strange, scary environment. I have a generic Xanax® prescription for Henry because he is overly terrified of nail trims. (We are working together with a groomer/trainer to show him that it isn’t too scary.) It doesn’t always work, so I am testing natural, herbal remedies with him as well. If your dog is particularly stressed while riding the subway and it is the only way you can get around, consider talking to your vet. It will be much more pleasant for your dog and your fellow passengers if her or she is calm and relaxed during your trip. You dog will have an easier time tolerating the subway if the two of you stay out of the way: stick to train car ends, if possible, and consider sliding your dog’s carrier under your seat. On a recent trip, Henry and I stuck to the corner. Also, avoid cars with musical acts, solicitors, or other performers if possible. Nothing can ruin a calm ride with Henry like a guitarist with an amp or a pack of teenagers performing acrobatics to loud music. If necessary, politely ask them to move to a different car, explaining that your dog is stressed. I have done this, and the performer was extremely understanding. Not all performers are sympathetic, so read the situation and react accordingly. It’s a little more peaceful on the floor under my seat. Not all subway riders take kindly to pets on the subway, especially a barking dog. Be sure to apologize if your dog makes a fuss: it may diffuse any frustration or anger that your fellow passengers feel. It might even help them be more welcoming to another passenger’s dog at a later date — help give all dog owners a good name! Have fun! I snapped a quick selfie with Henry on the G Train last winter. 7.) Try to Have Fun! Your dog has a better chance of relaxing if you’re relaxed as well. Take a deep breath, stay calm, and enjoy the ride! Owning a dog without having access to a car can be tricky and often stressful. 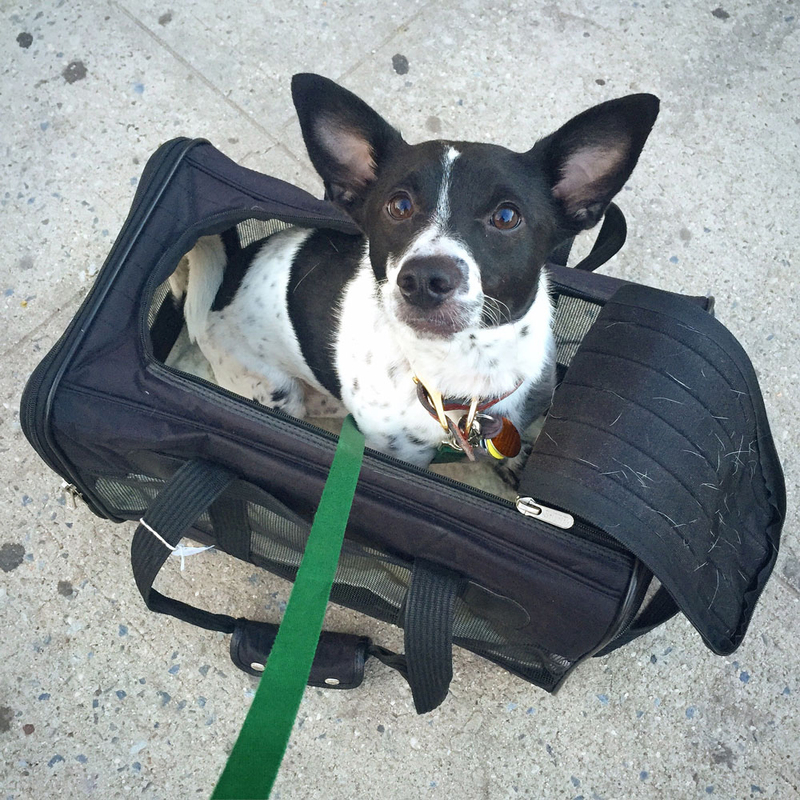 With a bit of planning on how to bring your dog on the subway, it doesn’t have to be too bad! Great tips for those who live near a subway! I really like “be kind” – that is always important! Thank you! I always try to be kind, but it’s extra important when you’re in an overcrowded space! We just got a SturdiBag that would be great for this. I would be terrified to take my dog outside of any good enclosed bag. I am too! There are a lot of reasons why it’s much safer for pups to be enclosed in these situations. Thank you! I’m not sure how the Boston rules differ from NYC’s rules. I do know that I love the T! This post is super applicable to us here in Chicago, too. The CTA has very similar rules for bringing dogs on. Of course, there are plenty of people who take those very loosely. I remember riding the bus once with a woman who had a chihuahua zipped up in her hoodie. Technically not breaking any rules and the little nugget was poking his sweet face out to receive pets. We have a rolling backpack-style carrier for Zoe that she would, frankly, prefer to never go in again. She just doesn’t like enclosed spaces! We definitely have people that don’t exactly follow the rules! I’ve seen dogs wandering the car, dragging their leashes behind them. That’s an adorable way to carry a chihuahua! Henry loves to go in his carrier because it means he isn’t getting left behind, but he gets a little nervous being so enclosed. Great post! Having your dog in a complete enclosed carrier is so important!!! Here in Minnesota we don’t have subways, at first I thought your post said, “How to bring your dog to Subways!” I was like, yes I can get a 6 inch sub!!! BOL!!! YES! Henry will have one six-inch, hold everything but the bacon. Ever never been on a subway, but these are great tips if Simba and I ever get on one! Wow, a Dane?! That’s definitely asking a little too much. Henry is absolutely adorable! I love all the tips you offer. We don’t have subways in our area, but I couldn’t imagine having to ride the subway with a large dog, I’m curious now and off to read Dog Jaunt’s article. I love this post. I need to check the rules in Chicago, but I don’t think dogs are allowed on the trains. Great tips which could be applied to flying as well – though probably wouldn’t encounter musicians or rowdy teenagers on a flight. LOL. Great tips. I think we are allowed to bring dogs on buses and on the subway in Toronto- Kilo has been once just on his leash at an off-peak time and no one said anything. Fishstick the Pug came to our filming of Backseat Barkers by subway without a carrier. I will have to check the rules. Kilo was terrified but behaved very well. I like the look of the carrier (it even has a pug face on the package). I may also look at things to calm him as he HATES vets and groomers, plus he resource-guards badly. Let me know if you find anything that works well. These are great tips! Dog’s aren’t allowed on our light rail 🙁 so I won’t be needing these tips after all. Love your blog! My dogs are a little big too big to fit in the bag, but it seems like a great bag for small-medium dogs! And since it’s fabric, it’s not too heavy!! What a great post. Henry is such a little trouper, & very brave to ride the subways! When I first adopted my cat I lived on Long Island and she was coming from Harlem, NYC. I had to take both the subway and the LIRR – I left work early to pick her up & avoid the rush hour. Thankfully my boss was a big animal lover, he actually came with me to get her in Harlem LOL! I’ve never taken my dogs on the subway in NY but I have seen the Hamptons crowd toting around little dogs in all kinds of carriers. Sherpa carriers are my favorite, I’ve used them for years. Thanks for this great advice for subway riding w/ your dog. Subways are awesome, I love them. We don’t have anything like that up here. But if we did, having a carrier like that would likely be the only safe way of taking a dog along. Unfortunately, our dogs are too big for that. They’re a great inexpensive way to get around. Henry wishes we had a car, but in the meantime he deals! Great tips! We live in AZ and have never rode the subway, but if I ever do I know what to do! Thank you! These sound like great suggestions to make a subway ride less stressful for the dog, as well as the other passengers. Thanks! It can definitely get stressful. Great information – we will revisit this prior to our next NYC trip! Oh it looks like Henry doesn’t mind at all! That’s awesome and great tips – do you take him to the office at all? The carrier looks really comfortable and easy to transport – this doesn’t look nearly as daunting as I thought it may be – such a great article for folks that take any public transportation and need to get their animals to the vet for example. Love this! Thanks! I unfortunately can’t bring him to the office but I would love to! It depends on the day – sometimes he deals and sometimes he hates it. The carrier is really great! Very easy. These are great ideas! Dogs have to get around too. 🙂 I’m sure the same (or similar) ideas would apply well to cats that need to travel on the subway. I ike your suggestion about stocking to a train end and keeping out of the flow of people. Al it takes is someone not to see you and the trample on a paw * ouch * Being safety and visibility conscious at all times means you do the best for you and your dog! This was a really fascinating read for me, because I honestly never really considered taking a dog on a subway, and what might be involved in doing that! As a dog trainer, I think you really nailed down the process that would be involved in preparing a dog to travel this way. And your photos were just adorable!! It would be difficult not having a car and depending on the subway for transportation. Your recommendations are great for those who need to travel this way. Thank you! It’s tough sometimes – hopefully we’ll be able to move somewhere soon where I can get a car! I have many New York friends and we travel there a few times a year. It is great to see an article on the subway and how to get a dog on. A lot of us can’t due to dog size, but I love your tips and happy to see this fab piece! Although we don’t live near a Subway and my pup are 45-70 lbs, these seem like great tips! It will help someone that is considering moving to a place like NYC and has a dog large, medium or small. I have never tried bringing my corgi on the subway, he is too energetic and don’t think he would like to be in one place. Even though i love seeing him running around the house barking and chasing the balls, i’m afraid that this would annoy other passengers. We recently got a puppy ! And he is 8 weeks old and want him to get a hang of taking the subways as we live in NYC , as you know now a days the trains are always packed ! Your tips helped so much , he was scared a bit but it was a 5 min train ride and I think he did fantastic !